I promise that title sounds fancier than the boxes really are. I love teachers (I am one! 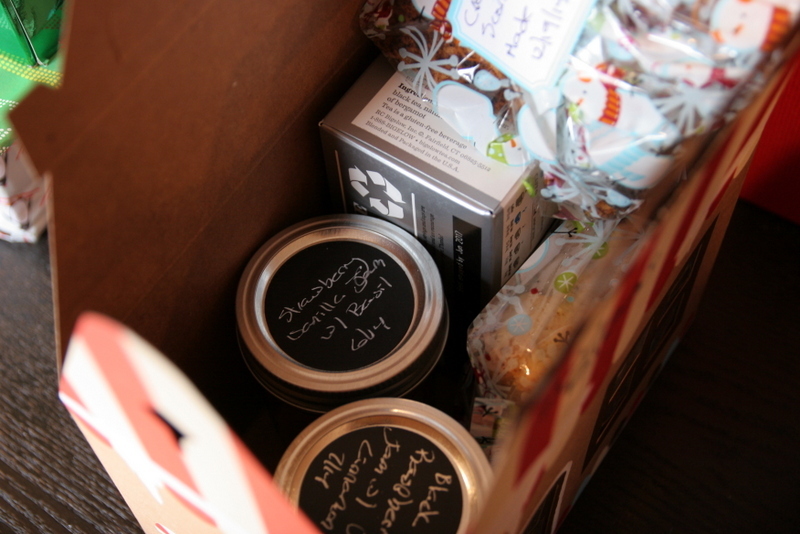 ), and I love putting these treat boxes together. This is just a little extra on top of the class gift, largely because I always have more jam than any three-person family could eat in a year. 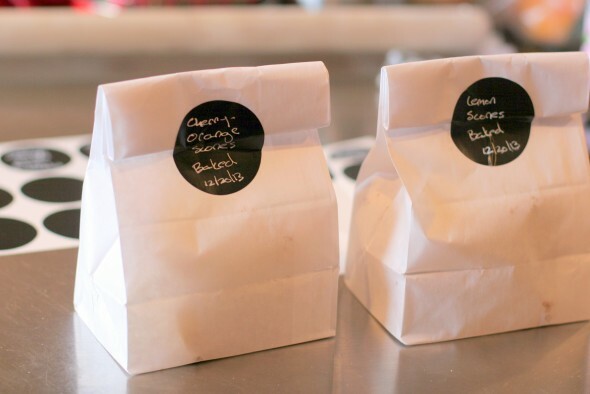 And you need something to put the jam on, hence…scones. Also, H’s school has just been completely amazing to her and for her, and I want to show my appreciation for their work with our little late bloomer as often as possible. Last year, H’s first at her school, I made gift boxes for her teacher, aide, the head of the school, and the marvelous admin. I put in some blueberry butter I’d made over the summer, a Starbucks card, and some homemade scones I made the same morning I delivered the boxes. 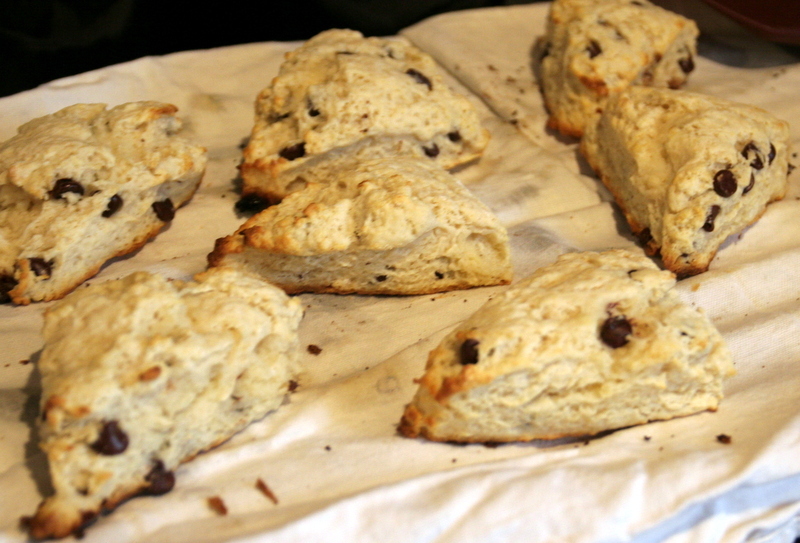 The scones were just so fast and easy that this year I kind of decided this was a tradition worth keeping up. And, again, I made all the scones last Friday morning while H was at school and then delivered them at the half day pickup. Both years I got the actual treat boxes from The Container Store. They’re just a really easy way to make a nice presentation, and since I used jam I’d made over the summer and scones I made from scratch, the cost was minor. 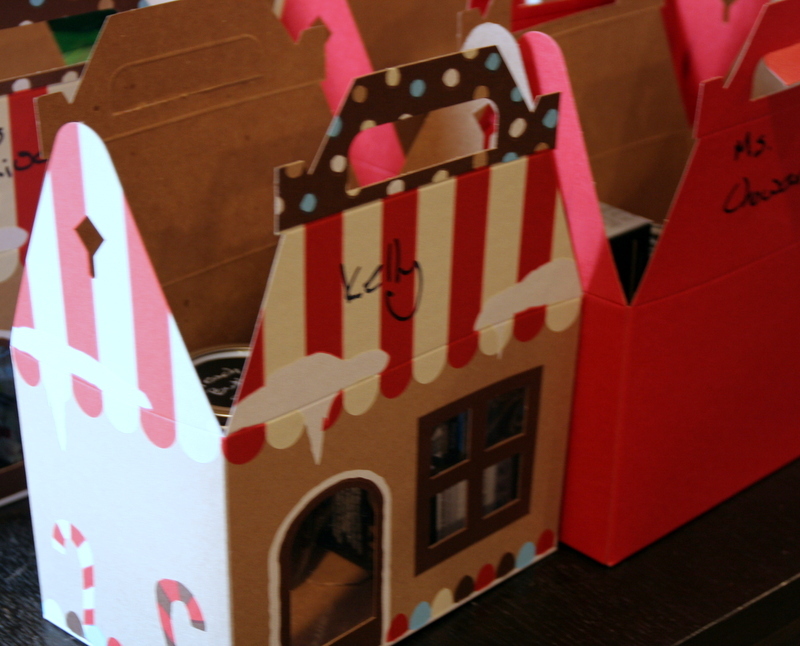 This year I made boxes for her feeding, speech, and occupational therapists, too. I also put in a box of really inexpensive black tea (like $3 a box). This time everyone got a fruit butter (peach or apple) and a jam (strawberry or black raspberry). All of those were already made an just waiting for good homes. Adjust an oven rack to the middle position and preheat the oven to 450. Line a baking sheet with parchment paper. In a food processor, pulse together the flour, sugar, baking powder and salt. Then add the butter and pulse a dozen times until it’s like cornmeal with some butter lumps. Move the mixture to a bowl and fold in the heavy cream until a dough forms. 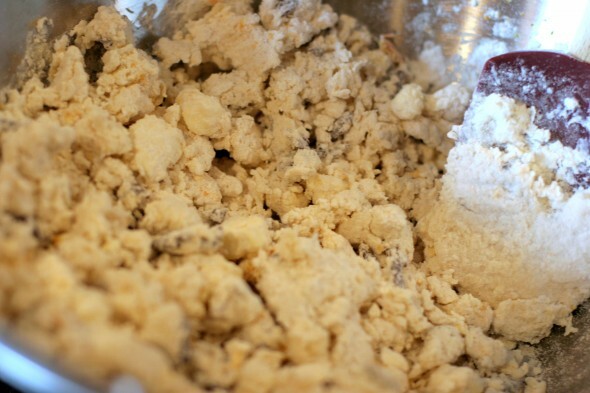 Dump the dough and any flour bits onto a floured surface and roll into a ball. Then smush the dough ball into a 9″ cake pan. 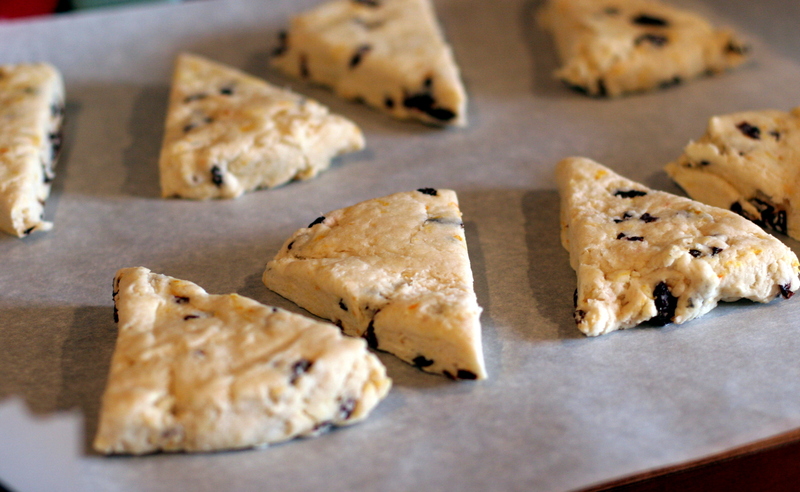 Unmold the dough and cut into 8 wedges. Bake the wedges on the cookie sheet for 12 to 15 minutes, until the tops are lightly golden. Be careful! The bottoms get brown really fast, so don’t overbake. Let them cool on a wire rack for 10 minutes and serve. Or wrap into paper or plastic treat bags like I did. So this year I made 3 kinds of scones: plain cream, orange, and chocolate chip. I added 1 teaspoon of grated orange zest to the mix when I added the butter, and voila! 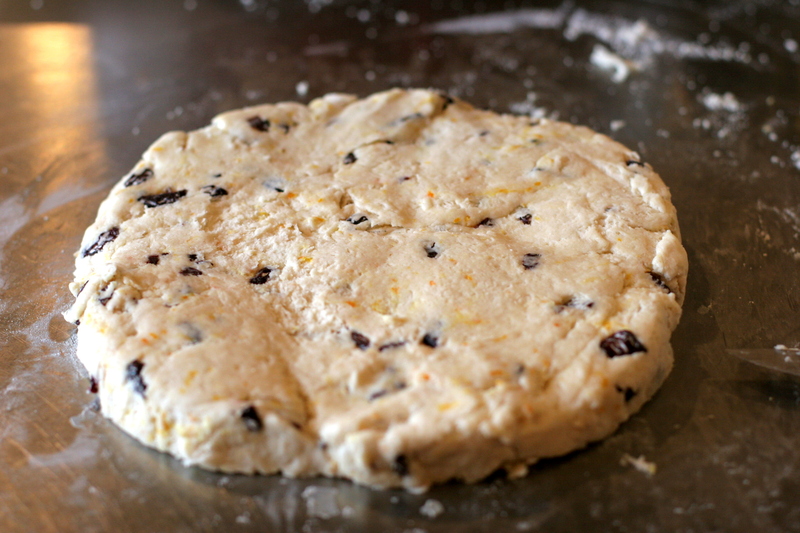 Orange zest scones. For the chocolate chip scones I added half a cup of semisweet chocolate chips when I added the heavy cream. 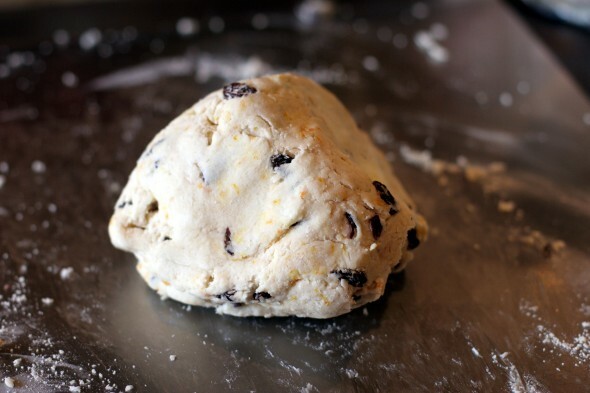 Last year I made cherry-orange scones, which were 1 teaspoon of orange zest with 3/4 cup chopped dried cherries. And I also made lemon scones, which were just 1 teaspoon of lemon zest added to the mix. So easy. I get home from the morning school run around 9, and I leave again at 11 for pickup. In two hours, this year I made 3 batches of scones and completely assembled all of these teacher and therapist boxes. This has become one of my favorite parts of the holiday season.